There has been news coverage recently of the digitisation and publication of films from the archive of the Royal Geographical Society, and BBC reporter Pallab Ghosh narrated a film on the BBC News channel (available during June 2017) about some of them. One such film comes within our purview, being a record of the 1933 Houston Expedition which flew biplanes over the Everest range. They shot movie footage and stills, including some infrared plates provided by Olaf Bloch at Ilford. In the early 1930s, infrared photography was something of a popular sensation and from about 1932 newspapers regularly printed large IR photographs demonstrating the ability to penetrate atmospheric haze and achieve extremely long distance views. The published book documenting the expedition, 'First over Everest', goes into some detail about the infrared setup. Plates came from Ilford, and by this time the sensitivity of infrared plates was such as to allow exposures 'as rapid as one-sixtieth' of a second. Taylor, Taylor & Hobson loaned a lens with an aperture of 4.5 and a focal length of 25 inches (635mm). The camera 'was a somewhat rough and ready improvisation made of plywood' which was sourced with the help of The Times newspaper and its legendary art editor Ulric Van den Bogaerde (father of actor Dirk Bogarde). There was, presumably, a quid pro quo because the Times had first publication of images from the expedition. 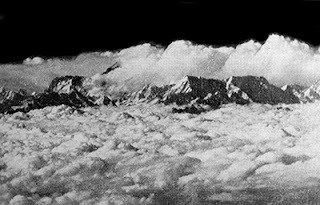 On May 8th 1933, almost exactly a month after the flight, the Times was able to publish the expedition's most famous photograph, showing the summit of Makalu, the fifth-highest mountain in the world and 22 km east of Mount Everest itself, rising above cloud from a distance of over 100 miles. The camera was very big and heavy and required special mounting in the plane. It was three feet long by a foot square and was placed under the fuselage, hanging in vibration-proof mountings where this aircraft was designed to carry torpedoes, and set up pointing forwards so that the field of view did not include the bottom cylinder of the engine. Plates were changed through a hatchway in the floor of the observer's cockpit. The observer had to hang upside down and put his head and hands through the floor to reach the rear frame of the camera and so access the wooden double half-plate dark slide ... hoping that the wind didn't whip it out of his hands. From this position the camera shutter could be operated. Lining up the shot involved either using the plane's intercom or, if necessary, writing notes. The cue between pilot and observer to take the shot was done using a piece of string. A sharp tug telling to pilot to line up and fly right, with a reverse pull giving the cue to fire the shutter. The size and weight of the infrared camera were such that it couldn't be fitted to the aircraft for the high altitude flights, so infrared photographs were taken on subsidiary flights, after the main sorties had been completed. There was the added problem that, being outside the fuselage, the camera and lens would have frozen up at the higher altitude. Electric heaters were used for both men and equipment (these were open cockpits) but heating an external camera would have taken too much current. Even though it doesn't mention the infrared work, the 1934 documentary film of the expedition, which won an Oscar that year, was called 'Wings over Everest' and is well worth a look. It's available to view freely on the BFI web site. There is a definite 'Boys Own' feel about the whole affair, and the BBC described observer Major Latham Valentine Stewart Blacker as being a real life Biggles. While some of the documentary was re-enacted in a typically 1930s way that we now see as being wooden, the real people are featured. But the expedition was filmed as it happened, including aerial footage shot from the cockpit which is a combination of shots from three of the flights. Two final notes: the expedition was named after Lady Lucy Houston (pronounced How-sten), who provided funds and was quite a character herself (check out the Wikipedia entry on her) and, as the BFI points out, the while thing was inspired by novelist John Buchan.